We are harnessing powerful human biology to radically reshape the treatment of some of today’s toughest diseases. We aspire to operate one of the most productive R&D engines in the biopharma industry. Our broad, diverse pipeline of novel, first-in-class medicines spans multiple therapeutic areas and diseases. Every program focuses on a large market indication with high unmet needs and a common goal: delivering outsized impact for patients. We have built our company around core scientific values that frame our approach to drug discovery and development. Significantly improving liver steatosis, inflammation, and fibrosis. 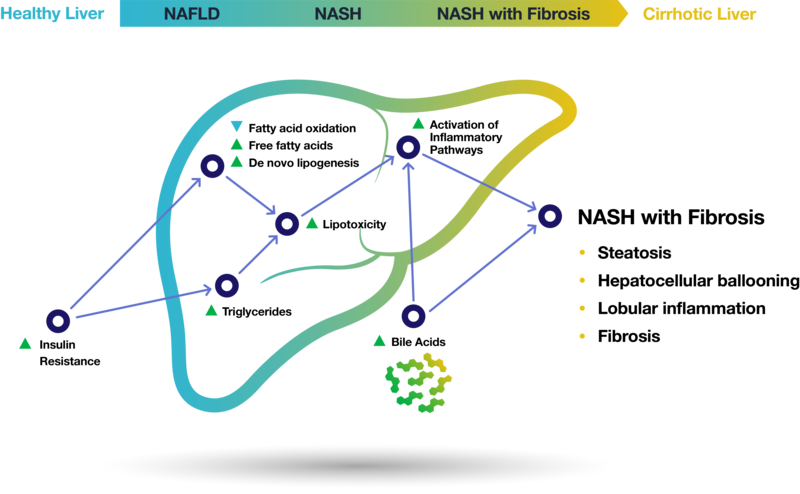 Our lead product, NGM282, is a first-in-class, non-tumorigenic, engineered variant of the human hormone FGF19 that has demonstrated a rapid regression of liver fibrosis and improvement in liver function by targeting multiple pathogenic pathways of NASH. Our People Are Our Platform. What makes NGM tick? Really smart team members who love working together to pursue great science and share a common drive to deliver a huge impact for patients. We have no hierarchies. We collaborate intensively, embrace risk freely and always swing for the fence.